I’ve never been much of a griller, but it’s definitely a skill I’m continuing to improve. I started having a BBQ in 2016 when Sarah was leaving for Texas for her first job. Since then I’ve slowly tried to improve my grilling skills and grilling recipes. The BBQ was so much fun that time, that I decided to do it every year in the summer. This year, I decided to improve on the potluck theme and had everyone bring something to contribute to the BBQ. I feel like in the past, it was optional. It definitely made it a less stressful to make sure there was enough food. I chose to make a spice rubbed chicken breast and spicy turkey burgers. This year to accommodate the vegetarians among us, I made quinoa burgers. There ended up being a LOT of food. I have leftovers still, but the variety was fantastic and everything was delicious. A great success. @qingai996 made a delicious Napoleon for my BBQ! A lot of people were able to make it and it was great to see everyone. Some people I haven’t hung out with in a while, so I was glad to get to spend the time with them. As the night went on we started a fire to enjoy the lovely night. The day had started out a little dreary with some light sprinkles, but it gave way to a nice relaxing day. 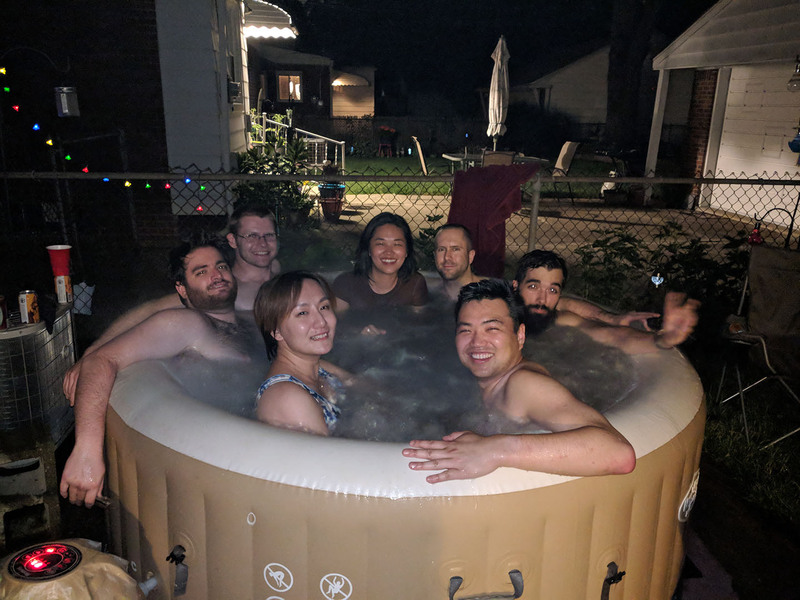 As people started leaving, and the population of the party dwindled, we broke open the hot tub and some of us hung out in it. As the night continued to wear on, I wanted to get on the roof and chill. So we did just that! Definitely a successful BBQ, can’t wait until the next time.